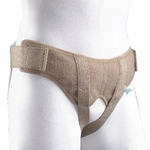 Both the FLA Soft Form Orthopedics Hernia Support Belt and FLA Hernia Brief offer pain relief from reducible inguinal hernias by providing gentle adjustable and comfortable pressure to the hernia. The hernia support brace for men has removable foam cushions that are designed to provide gradual pressure around the affected area with focused pressure on the groin/hernia, reducing and/or pushing the inguinal hernia back. Either pad can also be removed to treat a single hernia. Has a low profile that can be worn inconspicuously under most clothing.